The circles continued but after about 55 minutes I saw color. I’m thinking this thing must be 100 pounds! I had a fighting belt on but they are not all that handy when the fish you’re fighting keeps moving behind you and to the left in circles. Finally I get it to within gaffing range, and I take a shot. The gaff narrowly misses and somehow the line gets wrapped around the gaff hook! Possible major disaster! I carefully got it off and sank in the gaff, and put him up on my lap. If you’ve ever been on a tuna boat, you know how the fish make those rapid beating sounds on the deck when they are dropped off of the gaff. Well, this one did those, except he did that as I gave him a bear hug with gaff in his back. I wasn’t about to let this guy beat his way to freedom so I reached into his gills and did what I always do, which was to start ripping away at the gills to induce blood loss. This calmed him down a bit, and then I proceeded to give him a lobotomy with the gaff. Kurt was stoked and I was obviously elated to have had such early success. Interestingly enough, this was to be the largest one I landed on the entire trip. Our initial guesstimates were about 50-60 pounds. After 7 hours in the hot hold, it weighed out at 34#. Not bad. Probably a bit heavier when first boated so in the future I’m going to take a scale. 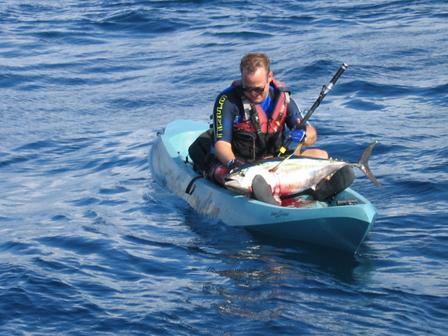 Actually after that fight I began to question just how big a tuna I was capable of landing from a yak given their fighting habits, which seem to negate most of the advantages that we usually gain on kayaks. seen that happen. By the time I got the stick out of the holder much of the line was gone and I panicked and locked the drag down, which caused the line to snap. Whatever it was, it was huge and this setup I was using was not going to be sufficient. 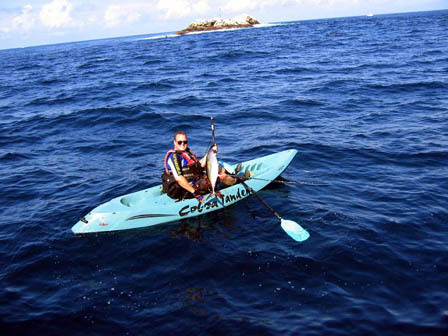 become more and more mobile, and every time Kurt would drop me off somewhere, they’d be 200 yards away by the time I was paddling. I began to realize that I had been very fortunate earlier on in the day. To reach the mobile tuna schools, we decided to have me use spinning gear with a jig. I was able to head them off with the jig and got a whole bunch of 12-15 pounders this way, which was fun on light tackle. Not that I had given up on the beasts. 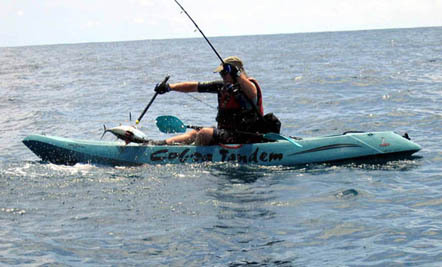 At one point, I took the biggest setup in the whole boat, a trolling stick with a Penn Intl. 50 or 80 Wide!! It was way too bulky but I had to try it. The day ended up with me hooked up onto a large fish again. I was on it for about 45 minutes and had gotten into that same stalemate, where my arm was just incapable of applying enough pressure to lift the tip up enough to turn its head or gain even a half a turn. At this point, the hook must have worn a big enough hole in the tuna’s jaw, and he came unbuttoned. Lucky fish! Perhaps in the future when targeting these fish I will use a 2 speed reel so that I can switch into a lower gear when a stalemate occurs. stoked the whole day to be involved in this yak fishing thing and before we even made it back we were planning our next adventure. second day, and the waves were crashing against the rocky outcropping. I didn’t know what to do, so I let the fish have just a bit of room to wiggle, hoping that he’d change direction. By this time I was about only 30 yards from where the waves were slapping against the rocks. Tat radioed me, saying that he was sure that it was a huge pargo (they can get up to 70 pounds there), and not to give him too much room, as he would just drag me to his cave and rock me. I thought I had the fish under enough pressure to keep him up. It was on 40# test, on a TLD 20 2 speed, and I had the drag down pretty tight, at least it seemed. Sure enough, he dragged me right to his house, and then surprised me with a sudden burst downward, followed by a disheartening snap. Tricky fish, those pargos. 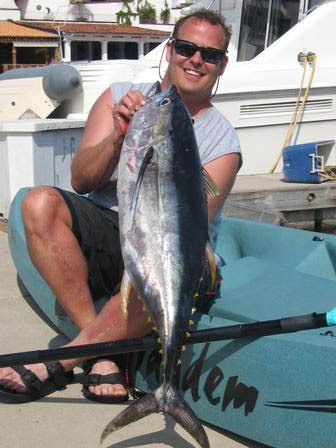 Giant tuna were jumping, and at least one boat landed a 150 # tuna, but I wanted to set a record and hook it from the yak, so even though I might have been able to hook into one easier on the boat I kept trying from the yak. In hindsight, due to the chop and current on this day, and the fact that the tuna were all over the place, this decision may have been based on an abundance of optimism, but I stuck to my stubborn plan. 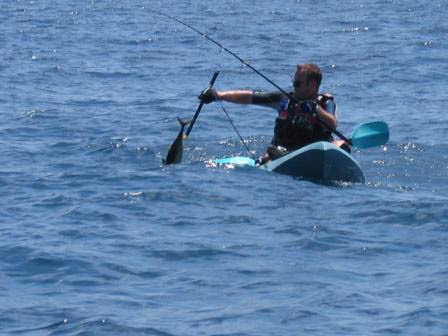 There were many moments when the schools of big tuna passed right under me, and 10 pound skippies and 50-100 pounders were jumping, but my skippy simply didn’t get hit. What can ya do? bouncing up and down right next to you. Two, from now on when targeting large fish I am going to set my drags to about 30% of line capacity, and leave it there. Up until this point I’d always fiddled with my drags, but drags set improperly on fish that take very long initial runs can result in one getting spooled quickly, or broken off. Third, and finally, I am going to show up with my own gear and be much more familiar with it. I want to be prepared for that next moment that my setup gets a massive hit from a beast, should I be so fortunate once again.